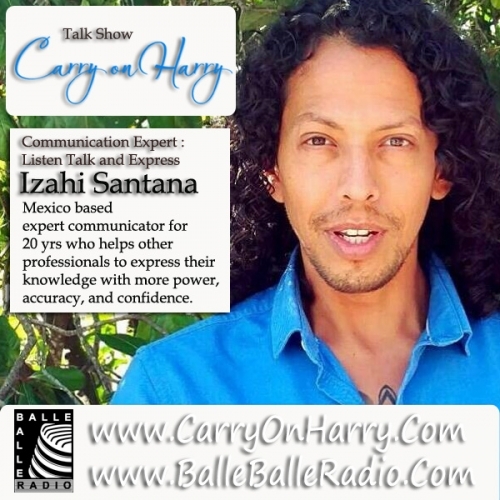 Studio Carry On Harry talk show guest Izahi Santana ,expert communicator for 20 yrs who helps other professionals to express their knowledge with more power, accuracy, and confidence. Izahi joined us from Mexico to share his valueable knowledge for listeners of Talk Show. According to him "Many people don't take this subject in consideration because they forget that just by doing something every day doesn't mean we automatically get good at it. Improving our communication skills is a game changer in our lives because it boost our personality, increases our opportunities, brings respect and admiration from those we work with and makes our relationships so much better. We can discuss how there is evidence of how each and every one of us are born confident, persistant and self-assured. How easy is to improve the way we communicate, and how little changes can make such a huge difference in our future." The Episode is on Air now at https://www.carryonharry.com/monthlypremiersmain2018.php where talk show host Harry Johal and Izahi have tried to understand what is communication and how to make it better ? How your communication skills are directly connected with success? Many Examples and tools were discussed in this 30 Minutes talks with guest expert.